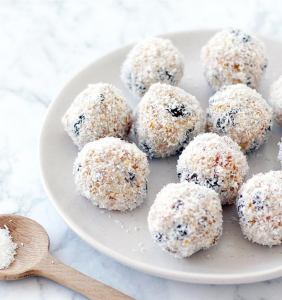 A delcious sweet snack to give you a burst of energy. In a bowl, mash peeled bananas. Add sultanas and dried apricots and mix to combine. Add puffed rice and the oats to the mixture. Mix together. You should end up with a moist, dough-like mixture. Allow to stand for five minutes. Shape into balls with your hands. Roll each formed ball into coconut to coat.